Sidama is a province in the southern part of Ethiopia. Well known for their highlands reaching elevations of 1,400 m to 2200 m, Sidama provides great conditions for growing high quality coffee. This natural processed coffee features silky body and dark chocolate sweetness with fruity flavor.Dry process, also known as unwashed or natural coffee, is the oldest method of processing coffee. The entire cherry after harvest is first cleaned and then placed in the sun to dry on tables or in thin layers on patios. The harvested cherries are usually sorted and cleaned, to separate the unripe, overripe and damaged cherries and to remove dirt, soil, twigs and leaves. This can be done by winnowing, which is commonly done by hand, using a large sieve. Any unwanted cherries or other material not winnowed away can be picked out from the top of the sieve. The ripe cherries can also be separated by flotation in washing channels close to the drying areas. The coffee cherries are spread out in the sun, either on large concrete or brick patios or on matting raised to waist height on trestles. As the cherries dry, they are raked or turned by hand to ensure even drying and prevent mildew. It may take up to 4 weeks before the cherries are dried to the optimum moisture content, depending on the weather conditions. On larger plantations, machine-drying is sometimes used to speed up the process after the coffee has been pre-dried in the sun for a few days. The drying operation is the most important stage of the process, since it affects the final quality of the green coffee. 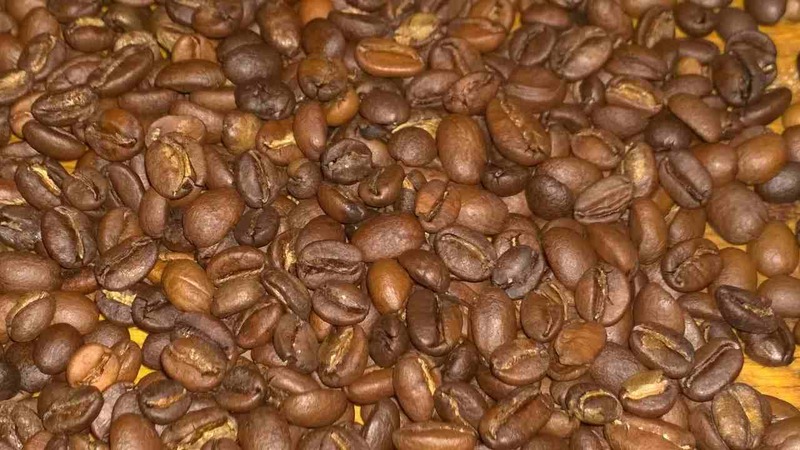 A coffee that has been overdried will become brittle and produce too many broken beans during hulling (broken beans are considered defective beans). Coffee that has not been dried sufficiently will be too moist and prone to rapid deterioration caused by the attack of fungi and bacteria. The dried cherries are stored in bulk in special silos until they are sent to the mill where hulling, sorting, grading and bagging take place. All the outer layers of the dried cherry are removed in one step by the hulling machine.